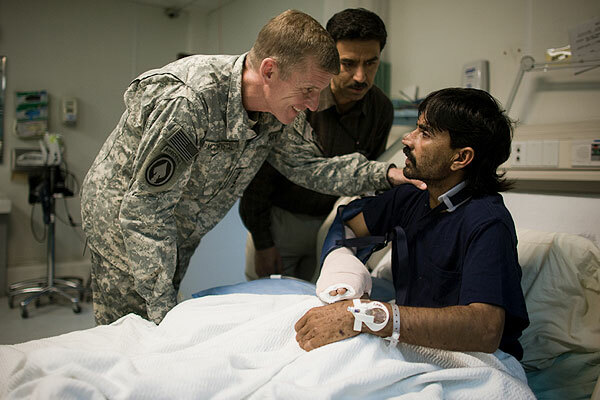 Gen. Stanley McChrystal on the job or posing for a photo-op? The fallout from the Rolling Stone article that cost General Stanley McChrystal his job has since calcified into a debate over what’s inferred when a journalist creates trust with his/her subject. There’s no doubt that Gen. McChrystal is one of the few people whose arrogance actually cost him his job. More times than not arrogance bullies over objection and consequence. To be such a frat boy, giving the finger etc. trashing the Prez, McChrystal, a four star general like any CEO should have known better. But then again, whose really surprised by such boorish behavior by a general. His biggest sin was his poor gamesmanship letting the pen be mightier than the sword. So McChrystal’s behavior isn’t what stirring the pot. Instead we find ourselves deciphering the reporter Michael Hastings’ true motives and thanks to him running his mouth we’re got some clues. He needs to learn the powerful lesson illustrated from his own Rolling Stone article and mind his words. He starts up spewing safe journalism 101 patter that, ” I went out to try to tell the best story that I could and write what I saw, I heard and thought. And I had really no control over, you know, the aftereffects,” he told CNN’s Howard Kurtz (transcript provided). Um actually he did. He had control in choosing those volatile snippets and vignettes out of days worth notes and reams of paper. He chose to lead the article with a built up story that ends with Gen. McChrystal giving the finger, which basically set the tone for the entire article, an article that pretends to be a discussion on the counter insurgency, which apparently was why Hastings was there in the first place. For example, Hastings could have embedded himself further on the front lines of counter insurgency, capturing antidotes of the obstacles of winning “hearts and minds” as a way of converting the Afghans to US thinking. Hastings is being disingenuous when he says, he didn’t think it was a matter of McChrystal and company letting their guard down. It’s time like these when people reduce life to a one deminsional transcript of what was said, what wasnt’; Hastings offfered this: “I mean, it’s not much of a mystery. If someone tells you something is off the record, I don’t print it.” …. but back to real 3-D life, actions speaks louder than words and if you are with a bunch of people and the conversation turns into bull session and some volatile stuff starts flying you as a reporter know right then that the quotes are verbal plastic explosives. Right there, I believe is the true test of character. Should you stash it away like a sneak and go back and try to illicit more goods from aids to brace the juicy quotes you now know will make some hot type? You know right there that your subject’s guard is down. Is this all kind of chess game, or contest where you take advantages of loop holes? Or do you inject a little bit of honor and remind the General that the record is rolling here. If the general really didn’t care than he’d just shrug him off. But Hastings didn’t say anything …. why … because he wanted to keep the good quotes flowing. Wow. Editors have power but I didn’t know they called in hits on people. Actually reporters and editors are usually engaged in what is suppose to be a constructive power-play over stories. The reporter supplies the goods, which basically means ferreting through notes building a case with one quote followed by antedate making the outcome obvious even to an editor. Definitely not all reporters don’t see building up trust as an illusion. I mean you can be friends with a cop, hang out, drink, but you might think about reminiscing about crimes gone by or buying drugs in the bathroom while he’s sitting there. The same with befriending a reporter. So in my book, the relationship isn’t an illusion, but it is dubious. A cop shouldn’t be making friends in hopes of catching someone and reporters shouldn’t be building trust so they can hang them by their own words. So the merits is defined by time spent on the lines? Then should Hastings be ranked against senior war correspondents, the same ones who would treat such Kvetching as off the record. Then how does Hasting’s real war experience, who gets to fly home and enjoy yapping about his time in the media, compare to the soldier? Being too close to the action doesn’t give you the entire story and you got to wonder how good is Hastings all access pass to the front is worth these days. Who knows he might find himself sitting back here with the rest of us grunts.